Copenhagen Phil, Ravel's Bolero, and Four Loko, or, why Irish coffee doesn't kill you. "Copenhagen Phil" may sound like a nickname for a snuff addict, but it's shorthand for the Copenhagen Philharmonic Orchestra. In the clip above, Copenhagen Phil assembles, flash mob style, in the city's main railroad station, and does a surprise performance of Ravel's Bolero, a piece of music to which I became addicted in my high school years, and recordings of which, I later remember reading, were supplied by the Soviet government to childless couples for its alleged--ahem--stimulative effect. No doubt this performance had a peculiarly stimulative effect. It's one thing to go to your seat in a concert hall knowing that you're going to hear Great Music, sit patiently while the orchestra slowly assembles and tunes, applaud the conductor's entrance, hush as the baton is raised, and listen. Its another to encounter highly skilled musicians performing such music at a time and in a place that's part of the ordinary routine of your daily life. Context engenders expectations. This gets us to Four Loko. In 2005, three Ohio State students invented a new alcoholic drink they named Four Loko. I'm going on a limb and guessing these students were guys, and that they were after what male students in my day and, I suspect, ever since, have been after: an easy way to get laid. Since they hadn't hit on the idea of inviting a woman into their dorm room and playing a recording of Bolero, they fell back on another classic, "Get her drunk." Drunk enough to overcome inhibition, but not so drunk that she passes out. So, mix in some caffeine to keep her awake. Also, disguise the taste of alcohol so thoroughly that she won't get her guard up. The resulting concoction, I've read (I haven't tried it), looks and tastes like fruit punch. When consuming alcohol in ways that are not typical for alcohol consumption, its effects are intensified. Instead of the usual tolerant response to a drug, where a user needs more of the substance in order to get the equivalent effect, a larger response occurs. In a 1976 paper in Science, Siegel termed this the situational specificity of tolerance. This would explain why few emergency room visits are the result of drinking Irish coffee: you expect it to have an alcoholic, as well as a stimulant, effect, and you can taste the whiskey. It may also explain why so many office parties lead to embarrassment: while some of those there may be people you socialize with over drinks after work, most of them won't be, and it's not likely to be held in your usual drinking venue. Context is important. Can the Mets at least satisfy modest hopes? Before the 2010 season, I allowed that I would be happy if the Mets just improved on their miserable performance the previous year, and finished no worse than third in their division. It was not to be. This year I expressed no such hope, though I inwardly clung to it. As I write this, the Mets are in third place by the narrowest of possible margins, a half game ahead of the Nationals. The Mets are where they are by dint of having won a series in Atlanta from their arch-nemeses, the Braves. This, however, came after they were swept in three by the Nats, dropping them from third to fourth. Such have been the Mets this year, playing well against good teams and poorly against mediocre ones. They've provided moments of satisfaction and, at times, excitement. They have nine games left. The best they can do is hang on to third. Let's go, Mets. 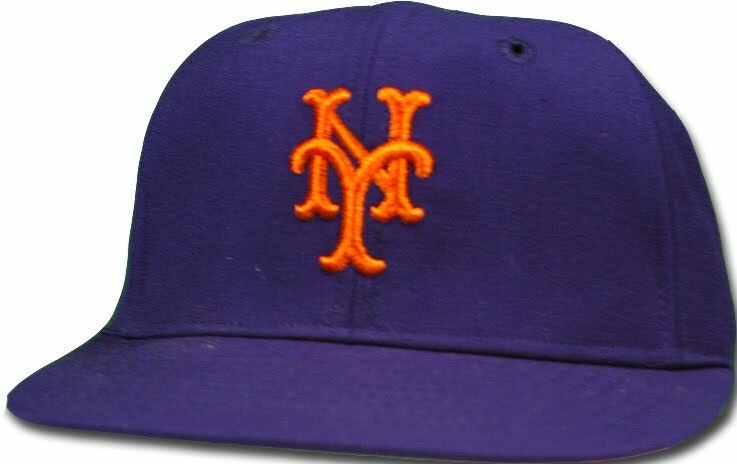 Mets cap image courtesy of Filipino Nurses, whose services the injury-plagued Mets could have used this season.